Sip coffee and learn the cool behind Retro Row! 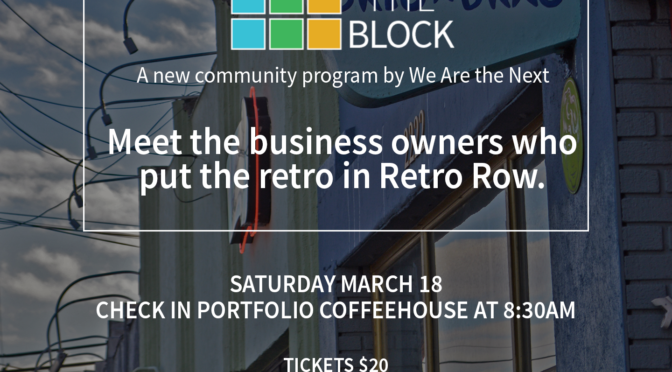 Saturday March 18th register and meet up for a Tour of Retro Row; Talk the Block hosted and coordinated by We are the Next! Go to wearethenext.org/talktheblock to make your reservation, or show up as they’ll also be selling tickets at the door (Portfolio at 4th & Junipero). 100% of ticket sales goes to support We Are the Next, a 501(c)(3) nonprofit organization that provides social justice and youth development programming in the community. Previous PostFeel Great, Plant a TreeNext PostWant to get around town? Need smart transit?